It seems that everywhere we turn lately, we are bombarded with new information and studies about how yoga can benefit bedraggled professionals and stressed-out executives. Yoga’s ability to bring balance to the mind, body and spirit has lured thousands of adults to the mat in search of rejuvenation and relief from the rigors of the rat race. But adults aren’t the only ones benefiting from yoga. Every week, the kids involved in the teen yoga program at Silver Lake Yoga are discovering a new approach to exercise as well as gaining valuable exposure to a broader cultural perspective. Mara, who favors a flow approach to yoga, leads her students through their postures at a quick pace that keeps their active, energetic minds focused. “At this age you have to keep things interactive and interesting. They have to be able to touch and feel more than adult students do.” They play games like “yogi says” and Mara sometimes includes traditional Indian dancing along with their hatha practice in order to expose the students to a different culture. “They love to learn all of the Sanskrit names for the postures and to hear the stories behind them,” explains Mara. 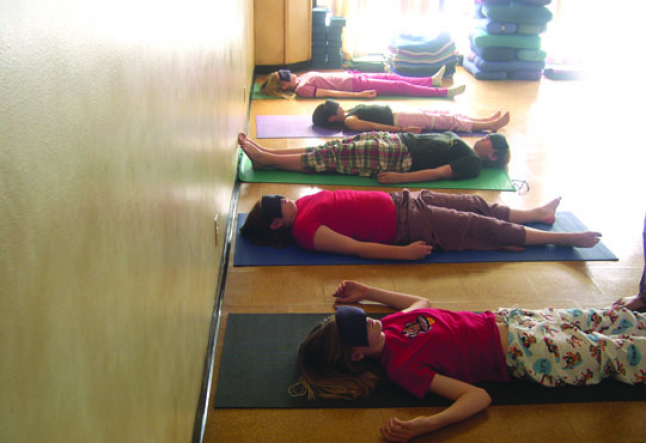 The education these students get in their yoga classes transcends what they learn in school. Though they are from different schools, there is a bond between these students that has grown up around their shared experience with yoga. One thing you will definitely not find in these teen classes is the heavy austerity that can sometimes accompany adult yoga classes. There is a lightness and sense of fun in these students’ practices that is reinforced by Mara’s positive, affirming instruction. The work these students are doing each week bodes well for the next generation of happy yogis.